Have you ever wanted to play for the IronPigs? The deadline to sign up is Monday, August 20 at 11 a.m. 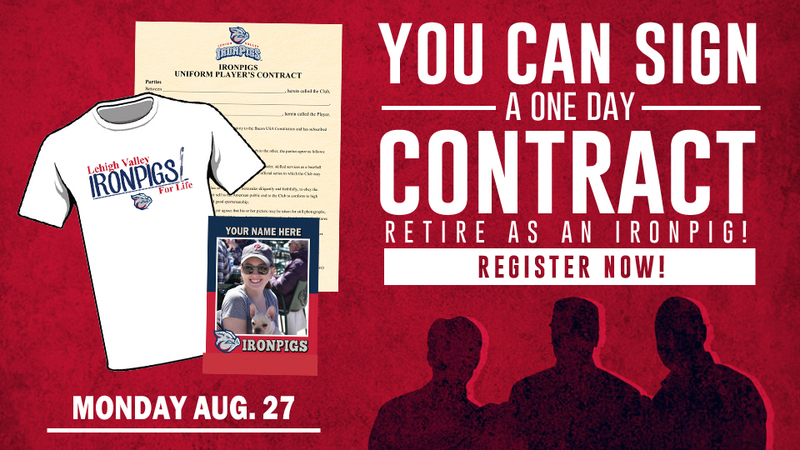 Fans retiring with the IronPigs will check in before 5:45 p.m. and be escorted to the field where they will be able to sign their one-day contract and have their photo taken as a member of the team. Each participant will receive a T-shirt and personalized baseball cards. The IronPigs have announced this promotion on the same day "Flyin' Hawaiian" Shane Victorino is scheduled to sign a one-day contract to retire as a Philadelphia Phillie. The event is part of Fan Appreciation Night during the Pigs' final home contest of the 2018 regular season. Sam Malone of Cat Country 96.1 will participate in the ceremony after signing his contract live on the air earlier this morning. For details, or to upgrade a previously purchased ticket to the one-day contract opportunity, contact the Coca-Cola Park ticket office at (610) 841-PIGS (7447) during regular business hours. A ticket with the one-day contract opportunity is just $35, while an upgrade to a ticket is just $25. Don't miss out on this exciting opportunity to officially become a member of the team you love to root for! The 2018 Season is the IronPigs' 11th season at Coca-Cola Park and 11th as the top affiliate of the Philadelphia Phillies. Fans can get closer to the team than ever before with a Bacon, USA membership -- a year-round IronPigs experience pass featuring numerous amenities such as savings on parking at games and at the Majestic Clubhouse Store at Coca-Cola Park, on-field VIP access to watch batting practice, access to the annual holiday party, and more. For more information, call (610) 841-PIGS (7447) x3.